Marcella Hazan’s Bolognese sauce recipe is the only Bolognese sauce recipe you ever need. It’s classic, authentic, Italian, easy, and delicious. I come from stirring stock. That is to say, my people are stirrers. It’s how my grandmother, avó Costa, cooked. She stood, facing the stove, for hours in her pink housecoat and pink slippers, her tiny hand planted on her hip, singing in her thin, reedy voice. She stirred all kinds of Portuguese comestibles: spicy stuffing with chunks of homemade chouriço; her famous pink (of course) chicken, rice, and potato soup; and vats and vats of kale soup. When she grew too old to stir her soups and stews for long, I’d do it for her. By then, age had stolen a few inches from her, but she still managed to peer over the tops of the pots and instruct, “Mais devagar, queirdo, mais devagar.” Slower, sweetheart, slower. I think it’s genetic. When the temperature outdoors nosedives, all I want to do is hover over a simmering pot and stir. 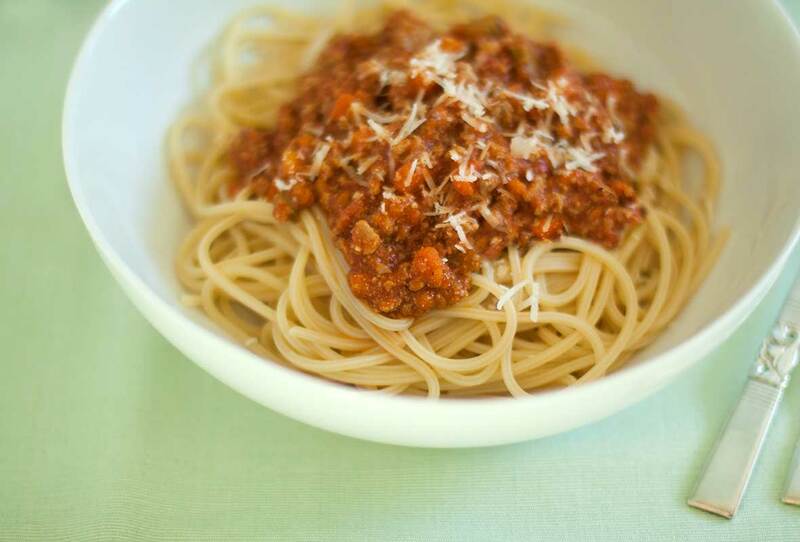 And what I’ve been craving lately is a long-simmered, deeply flavored Bolognese sauce recipe. The kind that takes no prisoners. The kind that makes your guests plead for the secret. (Are you reading this, Kate Jackson?) The kind that leaves you on the couch unable to move because you didn’t have enough sense to stop after your second helping of seconds. I’m certain if vovó had discovered Marcella Hazan’s ragu Bolognese in her lifetime, she would’ve petitioned the Pope to make us Italian. It’s her kind of dish. So my hunt was on for a Portuguese-grandmother-approved Bolognese sauce–rich, meaty, slow-cooked, constantly stirred–to quench that nagging craving. This narrowed the field exponentially. Anything from a 30-minute-meal proselytizer was clearly out of contention, as were recipes from TV chefs and hosts. I found—and promptly rejected—a recipe in Cook’s Illustrated that got the job done in two hours. (Two hours? I can’t find my way out of our pantry in two hours.) Then, while sitting in front of my cookbook collection, I was reminded of another short, sturdy woman who also comes from stirring stock: L’Imperatrice—The Empress—Marcella Hazan. I immediately downloaded The Essentials of Classic Italian Cooking. (Why I didn’t already have a copy is a question for another day.) Flipping through the book revealed a woman who spoke her mind, knew right from wrong, and who, if you disagreed with what she had to say, well, that was your problem. (Not at all unlike Momma Leite.) I knew The Empress wouldn’t let me down. And she didn’t. Her Bolognese sauce clocks in at a whopping six hours. That’s longer than some relationships I’ve seen. As I leaned against the stove with my iPad in its kitchen condom, a gorgeous sauce burbling down to sweet goodness in the pot, I was connecting to my past—to my stirrers. And to a craving even deeper, to be with my avó just one more time. 1. Heat the oil and 6 tablespoons butter in a heavy 5-quart Dutch oven over medium heat until the butter melts and stops foaming. Toss in the onion and cook, stirring frequently, until the onion is softened and translucent, about 5 minutes. 2. Dump in the celery and carrot and cook, stirring to coat them with the oil and butter, for 2 minutes. 3. Add the ground chuck (veal, if using) and pork, a very healthy pinch of salt, and a goodly amount of pepper. Crumble the meat with a wooden spoon and cook, stirring occasionally, until the meats have lost their raw red color. 4. Reduce the heat to low. Pour in the milk and simmer gently, stirring frequently, until the liquid has burbled away completely, about 1 hour. Stir in the nutmeg. Pour in the wine and gently simmer, stirring frequently, until it has evaporated, about 1 1/4 hours. 5. Add the tomato purée or crushed tomatoes and stir well. When the tomato puree begins to bubble, turn down the heat so that the sauce cooks at the laziest of simmers with just an intermittent bubble breaking through the surface. 6. Cook, uncovered, for 3 hours or more, stirring from time to time. While the sauce is burbling away, there’s a chance that it’ll start drying out somewhat. To keep the sauce from sticking to the bottom of the pot and scorching, add 1/2 cup water if necessary, just know that it’s crucial that by the time the sauce has finished simmering, the water should be completely evaporated, and the fat should separate from the sauce. Take a spoonful—or two. Season with salt and pepper to taste. 7. Add the remaining 2 tablespoons butter to the hot pasta and toss with the sauce. 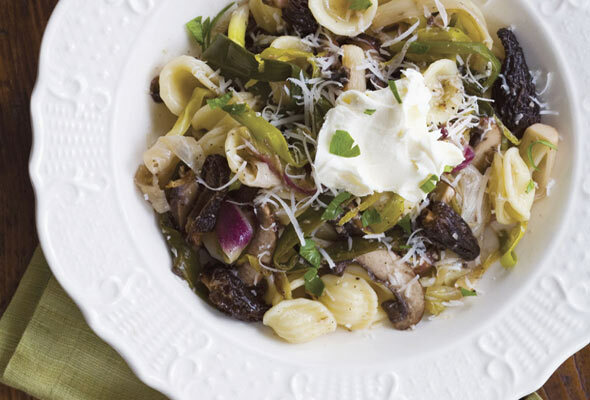 Serve with freshly grated Parmigiano-Reggiano on the side. Marcella Hazan's Bolognese Sauce Recipe © 1992 Marcella Hazan. Photos © 2012 David Leite. All rights reserved. All recipes and photos used with permission of the publisher. This is the perfect recipe to make if you are stuck in the house doing chores and can’t leave. A little prep work and a little stir every now and then gives you a wonderful smell throughout your house and a nice, thick sauce for your pasta. I love that there isn’t a strong tomato taste to this sauce, unlike most commercial jar sauces. This is pure, hearty, stick-to-your-ribs comfort food. All you need is some warm bread and you have a meal. The next time I make it I will probably omit the vegetable oil, as I felt there was a little too much oil floating on top when it was ready to serve. I’ve made this recipe about a half a dozen times since my first attempt, and I just made it again tonight. This ragu Bolgonese recipe is everything I was hoping for. The first time I made it, my butcher shop didn’t have veal, so I substituted 1/2 pound ground chuck. I was so skeptical about putting in the milk before the wine, but everything happened according to the recipe…and the flavor? Rich depth, just like the restaurant version I’ve been trying to duplicate for years—but even better. Thanks for sharing the recipe, this one is a keeper. The surprising part was no garlic, and I did not even miss it in the final flavor, as it reads authentic Italian all the way. Mrs. E, that is wonderful beyond words. Many thanks for taking the time to comment so effusively! Wishing you many, many more evenings spent at the table with family and friends and this keeper of a recipe. You have helped me forget all the media examples of ragu that have bobbed to the surface. I am pleased as well to read that Mrs. E prefers the homemade to the restaurant version. If there is a single recipe that points to the origin of good Italian cooking–the home–it is this one. Where I come from, Emilia-Romagna, a restaurant’s ragu is commendable only to the degree that it approaches what la mamma or la nonna makes in her kitchen. Thank you for this, David. You have made me happy. And Momma H., you have honored and graced us with your presence. Thank you for dropping by, and I’m sure Mrs.–and all our readers–will be utterly delighted you responded! After several failed attempts over the years at making a good bolgonese sauce, I want to express to Marcella Hazan what a boost of confidence and sense of accomplishment her recipe has given me. I would love to start cooking more of her authentic Italian recipes recipes. Now, I can not stop thinking about purchasing her book and trying to make my own fresh pasta for the first time. Marcella has truly inspired me. Her passion for cooking and sharing these authentic recipes has definitely rubbed off on me. Thank you, Marcella, for sharing your knowledge, secrets, and love of cooking, and David thank you for posting this recipe on your blog!. I’ve been making this for many years, and the original recipe from The Classic Italian Cookbook calls for cooking the meat/vegetable mixture with wine before adding the milk. Marcella changed this when she published her first two cookbooks in combined form as Essentials of Classic Italian Cooking. I’ve made it both ways and prefer the original. Kevin, fascinating. What do you see as the difference? This makes a great Bolognese. I do believe the wine should be 1st after you have browned the meat. The purpose is to use the wine to deglaze the pan. The wine is cooked out in several minutes. Then the milk which will take a lot longer at a simmer to cook out. Chris, glad you like it. Marcella says the milk goes in first because it sweetens the meat slightly. My apologies, I didn’t realize this was a doubled recipe because it says it makes 4 servings. Kim, not a problem. It says “makes 4 cups,” which is a quart. That’s a lot of sauce! I, too, prefer the original way. I made it yesterday. Joan, as I asked Kevin, what do you see as the major flavor difference? I’m curious. I originally made this from Marcella’s first book. When I “retired” first book for Essentials I noticed the difference and tried it that way. Seems it took lots longer to get it started with milk first than wine first. Don’t get me wrong. I cook this sauce for a minimum of 4 hours (yesterday 5) but don’t take as long with the simmering wine and milk as you do. I don’t cook it rapidly but don’t simmer until dissipated. As far as taste… honestly did not notice difference. ALSO, in first book she uses 1/2 cup of milk instead of 1 cup which, to me, is enough. Hope I am clear!!! Joan, you are indeed. What I was after, and you provided, was how it was different so that curious readers could make it, too. So, thanks! Thanks for the great ragu inspiration. Only modifications I made were to omit the veal (using a 50/50 mix of lean beef and pork ground to order) and add a bit of julienned carrot to the pasta water a minute or two before draining. Love the long cooking and warm oven in a January kitchen. Irene, you’re more than welcome. And the dish looks fantastic! After learning of this recipe through this site, I became a believer after making this delicious sauce. Soon after trying the recipe I purchased Marcella Hazan’s book and I love it! I received a pasta maker as a gift and I have already experimented with fresh pasta. I have also made the green spinach lasagna with this sauce, it was delicious! Thank you David for posting this recipe! Dawn, your comment was 100% perfect because 1.) You found the recipe, 2.) You liked the recipe, 3.) You bought the book, and 4.) You made even more from it. What more can a publisher ask?! FoodieGoesHealthy, thank you. Thanks very kind. It’s always amazing to me that so many of us have this deep connection to food through our grandmothers. I hope that continues as many people step away from the stove…. It is so wonderful to know that the Hazan version of ragu is still being made, enjoyed, and adored. In 1980, her book “Classic Italian Cooking” was published and its ragu has been a recipe to which I return again and again. Her instructions on risotto and polenta are also impeccable and should be followed precisely. I never make the Bolognese unless I can obtain veal and have even used cream once instead of milk, though my cardiologist has to be kept in the dark. Thanks to both of you! Dennis, yes, her sauce is alive and well and living in my kitchen–and the kitchens of many. Her risotto recipe is one of my favorites, too–really a master class in patience. I wish you could send a copy of this recipe to Prince William and Kate. Parade magazine printed his favorite recipe of ground beef and pasta and I decided to make it…it was completely tasteless. I don’t think the Brits do much flavoring. This would warm William, Harry, and Kate’s evening with a good bottle of their favorite wine. Ha, Marilyn! I’ll get my UK readers on the case. I am always troubled when a recipe calls for wine. Yes, I cook with it but I never know what “flavor” to buy when a recipe calls for “dry white wine” or a “hearty red.” What dry white do you think was used by MH? JuneC, while I don’t know for certain what the lovely Marcella Hazan used in terms of a dry white wine for cooking, I dare say she would have used a Pinot Grigio. (If not sticking to Italian whites, a sauvignon blanc would also work well.) In response to the larger question, you don’t want to uncork an amazing bottle of wine to pour into a pot, but you do want to use the same quality wine that you’d pour into a glass for yourself. Thank you for the information, I have the heavy pot to cook this in so now I will get the wine. Wonderful, JuneC. Would love to hear what you think of the Bolognese—and the wine, of course. Perhaps for the next time you make it, JuneC? Yes, MariaC. May she rest in peace, and may her loved ones take comfort in their memories of this lovely, lovely lady. Yes Alex, a true loss. I treasure her recipes and her valuable cooking wisdom. Ahhhhhh! You have found the recipe for the only sauce Bolognese I ever make. Have a good rest Mrs. Hazan. She leaves behind an amazing legacy, Vivien. This recipe is a true bolognese. It is a meat sauce. Not a tomato sauce. It is rich, very rich with the oils of 3 meats, whole milk and butter. It is cooked slowly for many hours to meld flavors. This recipe is classic and wonderful. It must be made slow. It must not be rushed. You do not want to crank up the heat to get it done more quickly because of a busy schedule. Make it only when you have the time to dedicate to it. I love how we need ‘kosher salt’ and then have minced meat with milk! Why ‘adapt’ these recipes when their strength is in their simplicity? VCM, the Kosher salt is simply because I use it. Marcella calls for salt. And in the her recipe, she calls for ground meat and milk. No adaptation there. Here in the U.S. the meat is fattier – I’d probably only use oil if I were making this in Italy – the meat, both pork and beef, in Italy is much, much leaner. Barbara, thanks for writing. Actually, the pork in the U.S. is leaner than Europe. I can’t speak for Italy, but in Spain, Portugal, and some part of France it’s fattier. I can see our beef being fattier for sure. When I prepare Marcella Hazan’s recipes, I almost feel as if she comes along right beside me with her nod of approval, guiding me through the cooking process with her descriptive recipes and anecdotes. I feel truly blessed to obtain success and inspiration in the kitchen with each every recipe I’ve made. Through her cookbooks, she, in fact, teaches much like a grandmother would, passing her recipes and methods down to future generations. 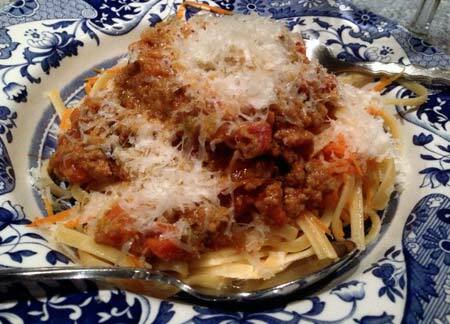 This Bolognese recipe in particular is what lead me to discover and take notice of the LC site. I am reminded of many reasons to be ever so grateful for Marcella Hazan and her contributions of helping promote proper Italian home cooking. Mrs. Dawn E., I think you have expressed the feelings of many, many cooks from around the world. Marcella will be missed but her work and spirit live on, every time you heave a pot an the stove and begin sautéing onions. Careful there….you’re pffff-ing Marcella Hazan. Plus there is no garlic is classic Bolognese sauce. In fact, garlic isn’t used that much (or at all) in dishes from the region. I read about this recipe in the New York Times obituary of MH. I want to try it but my husband doesn’t eat red meat…can I make it with ground turkey? You certainly can, Amanda. It won’t have quite the same taste as the original, but then, you already knew that. But I think it will still be quite lovely. Hope you feel the same. And we look forward to hearing what you think. I’ll try it! I have long since let go of the idea of the same taste, rats, but I try whenever possible to make things like this because I love them and won’t give up! I am 100% behind you, Amanda! John, David is correct – in the north, we’re not as big a fan of the garlic as in the south – but I’ll say, I’ve started adding the garlic, and my parents haven’t been complaining – and that’s saying something. They complain about any deviations from the originals :) I’ll point out though, that if you follow the recipe correctly and plan to simmer for 3+ hours, you’ll lose all the garlic anyhow. What I typically do, is prior to serving, I’ll saute the garlic in a tablespoon or 2 of olive oil, and then add that to the ragu, and then continue warming the ragu up (if coming out of the fridge). If it’s fresh, then let it sit in the warm sauce for 30 minutes prior to heating. This gives you the garlic flavor you’re probably looking for – and as always, you can adjust the amount of garlic to your tastes. It’s fantastic, particularly when paired with bread we lightly pan fry in rosemary/olive oil. Yum! I have a pot of this simmering on the stove right now. It smells wonderful, and it has 2 hours or so of simmering to go still. While there’s no garlic in the sauce, some garlic bread would taste pretty good with it. We’ll have some green beans on the side. Mmmm… it’ll be worth the wait. I also ordered Ms. Hazan’s book. Can’t wait for that to arrive also! I think you do know what to say, Peter. And you just said it. In quite lovely fashion. just made the Marcella Hazan Tomato Sauce with onion and butter for the first time last night. I don’t know how I missed Marcella but I’m a devotee now. Have the book on my wish list for Christmas and will probably make this recipe in the coming weeks. Love the idea of it taking hours – especially in winter! I also read another version that called for adding the wine first somewhere on the internet… Reminded me of one of my favorite paella recipes with sherry… Thanks for posting this! Kat, Marcella Hazan was a treasure. Please let me know how it turns out once you make it. Happy saucing. I’ve been eyeing this recipe for awhile and was always put off by the amount of time needed for the simmering. But my curiosity got the better of me, and, being a blustery day outside, I decided to just get on with it. I’ve made other bolognese sauces before but even though they seemed nice and thick in the pot, I would get a bit of watery juice at the bottom of my pasta bowl. But this?! Uh uh. Nice and thick and delicious and wonderful and yummy and I could go on! Even my husband, who’s always impatient when it comes to something like this, had no complaints. His memory of, “Just open a can of sauce and throw some meatballs into it” had completely faded. This is definitely going to be part of my recipe rotation. Thanks again for your wonderful site. I look forward to my next discovery! Judy, music to my ears! Thanks. And I hope you snoop around more, because you’ll definitely find a lot more keeper recipes here. Susan, I have, and it freezes like a dream. This is a very forgiving recipe. You can make it with all sorts of approximations of ingredients and it will turn out great. I’ve used wine that had changed color and smelled funny, Condatina tomato paste, cheap vegs, and fatty (22%) ground beef, and it still came out like the kind I remember my Modenese noni serving to me as kid. The same has been true when I’ve made chicken tortollini or baccala ragu. For me, at least, the food from Emilia-Romagna is about slowly making food complex enough that not only is it more than the sum of its parts, its parts should be mostly a mystery to the uninitiated. Hear, hear, John. Well said. Beth, and her bossiness worked. I think this is a killer recipe. It’s the only one I use these days. David, you are so right. This recipe is killer! Even my BF who doesn’t like pasta (I know, it’s sick) went back for more. This is amazing. Beth, it doesn’t happen often, but when I’m right, I’m right! Tell your BF to keep coming back for more. Courtney, I don’t think there would be any ill effects; I’ve doubled it often. I’d just suggest browning the meats in batches. Otherwise, you should be good to go. The picture at the start of this article is a poor choice. In Hazan’s Bolognese sauce recipe she says (1) don’t serve on spaghetti, and (2) toss the noodles and sauce and don’t just let the sauce sit atop. This picture is not what the recipe should look like. You’re completely right, Paul. (Funny, though, when Marcella was alive and visited the page, she didn’t seem to have a problem with it.) But as I only had spaghetti on hand when I shot it, that’s what I used. And when I tossed it in, as I do at home, it didn’t look great. Better creative license than turning people away from it. But thank you for that. And that being said, everyone, Marcella first choice is tagliatelle, and, of course, tossed it before serving. I always served it on spaghetti and it did not stick well. So, now I know why. From now on it’s on a wider flatter noodle for the adults. I actually like to serve my Italian sauces dishes with rotini because my 5 little grand kids can more easily get the sauce and noodle onto their spoons and forks. Paul must be one heck of an obsessive compulsive individual…in a good way. If something should be done in a certain way then it should be done that way. That’s the reason why, Stu. Chunky sauces slide off of thin noodles. They need pasta shapes that can hold the little bits of veggies or meat. Rigatoni, conchiglie, and fusilli are also Marcella’s recommendations. And we love OCD folks. They keep us on our toes! To David Leite: Before our entire class entered medical school, we had to take the MMPI, which is a personality test, Minnesota Multiphasic Personality Inventory test. We had to score high on the obsessive compulsive neurosis portion or we could not get into med school. Therefore, from now on, its only rigatoni, conchiglie, fusilli or tagliatelle. If I’m forced to use any other pasta shape, I will likely have a panic attack. And the good thing, Stu, is you can write yourself a prescription for Xanax. I found this recipe with relief. I’ve cooked it several times over the years but not for a while. My original copy of Marcella’s book was collateral damage in a messy relationship breakup (long story), so I wrote it out from memory and stored it on my pc. Or so I thought. When I looked today, vanished. doncha just love technology… Anyway, I just wanted to check the quantities. It is the most divine dish. It tastes most of one thing: love. You follow the method, you get lost in the process, the flavours are to die for, the taste sublime. So thank you for sharing. (btw i’d prefer to sing the whole of Oklahoma, but that’s just me). I will pick you up on one point. You’ve edited out one of my favourite details. When you’ve finally finished adding things, you leave the pot to simmer. Marcela is very precise here: she insists you set your ring to the lowest heat to ensure that THERE ARE NO MORE THAN THREE BUBBLES BREAKING THE SURFACE. It’s unbelievably precise and off-the-scale controlling, but god it’s a good tip. Richard, well, I’m glad you’re back with the recipe. The version of the book I have says, “…with just an intermittent bubble breaking through the surface.” Which was so specific, I kept it in above. Three bubbles! How extraordinarily precise. I’m confused by the sentence I’ve copied above. First of all, it can’t possibly be accurate; if all the water evaporates, the sauce is becomes a mixture of powder and rock-hard chunks of former food. What I assume it means is that if I draw a spoon through the middle of the sauce, it stays parted like Moses did to the Red Sea. When I made this sauce in this way, I found the end result inedible. In the dozen or two experiments that I’ve run since then, I discovered that when the sauce is too dry, some of the flavors become very harsh. It makes sense, because some flavors are water soluble, and without enough water, you won’t be able to taste them. However, the above picture looks pretty dry to me and I’m not sure why that hasn’t worked for me. Greg, it definitely mean what it says: that the water evaporates. And it won’t be a mixture of powder and rock-hard chunks because there is fat in it, as well as moisture in the meat, tomatoes, etc. Basically, make sure that the added water evaporates, and only the added water. Hope this helps. David, thanks for replying. Afraid it doesn’t help, though….you’d have to reach through the screen and taste what I’d made. As I said, my batch of Hazan’s Bolognese was inedible. Had to throw it away. It tasted…vegetably (is that a word?). I’m not sure if this is something I’m doing wrong, or I don’t know what this sort of Bolognese is supposed to taste like. Other recipes seem more liquid….”The Splendid Table” says consistency of thick soup, which is a lot thinner than Hazan’s Bolognese, or so it seems to me. I probably suffer from not ever eaten a true Bolognese, so I don’t know what all the fuss is about. I’ve never actually seen it on any of the menus of the Italian restaurants in my city, and I’m not sure it would be an accurate rendition if I did. Road trip! Where is the best Bolognese that you’ve ever eaten? Greg, I’m at a loss. Send me an email at david@leitesculinaria.com, and perhaps we can set up a call or a Skype conversation, so I can see what you’re doing. Thank you for sharing this recipe. I am one to improvise on recipes or forget steps, but in honor of Marcella, I followed the recipe to a “T” and didn’t add anything extra. It came out amazing. The recipe takes time but is simple in technique, and it taught me how much of a difference time can make. In my improvisational cooking style, I never put too much thought into time and layering flavors. Not only is this a recipe I’ll keep forever, but the skeleton of the recipe will help me cook more thoughtfully. Tara, then Marcella (and I guess me, in the smallest of ways) have done our jobs. Now, you can go on to show others the benefit and pleasure of slow, layered cooking! This is a fabulous recipe, which I’ve made a few dozen times both at home and in restaurants where I’ve worked. The only change I’ve ever incorporated is the addition of some chicken livers, which I mince so that my children don’t know that liver is part of the whole. Try it some time. Mark, yes, chicken livers are a favorite addition, some say it’s the classic recipe. If I remember to pick them up, I add them. Gives some nice bass notes. I had no idea the recipes differed from Classic Italian Cooking to Essentials! I just dug out my beat-to-death copy of the original. Lo and behold, it’s true. I then pulled Giuliano Hazan’s The Classic Pasta Cookbook (sadly out of print), the best book on pasta that I own, to see which one he follows. Wine first! My grandmother made homemade manicotti with crepes (crespelle), not pasta. I have made that crepe recipe and filled it with this Bolognese sauce; delicious. I topped it with tomato sauce, but I am thinking maybe topping it with béchamel sauce would be the way to go. Next time. Yes, they do vary somewhat, Victoria. But glad you’re intrigued. And when you make it, please let me know! Love the sound of this recipe. Sadly I can’t eat dairy. Has anyone tried any substitutions for the milk and butter? Let’s ask and find out, Holly! Anyone? Well, I’m a devotee of the Mozza Cookbook bolo for the obvious reason that I wrote the book, but your unending passion towards Marcella’s recipe is going to force me to branch out and try this. Maybe even side by delicious side. The big diff (that I can see): Mozza doesn’t use beef, just pork and veal, and, Mozza being Mozza, they also start with pork– pancetta to be specific. Well, my esteemed colleague, I would love to know what you think! How do I describe the deliciousness that is Marcella Hazan’s Bolognese sauce…..it made my husband weak in the knees and me swoon. This sauce is divine. It is now my go to sauce when I want to impress my dinner guests with a delectable meal. I too enjoy the laziness and the slowness it takes for this sauce to develop its flavor. Thank you for introducing me to this wonderful Italian dish. Carrie, right? So glad you both enjoyed it so much. This looks and sounds divine. This may be a dumb question, but when you say that the fat should separate from the sauce… do we skim it off and remove it? Planning to try the recipe tomorrow! 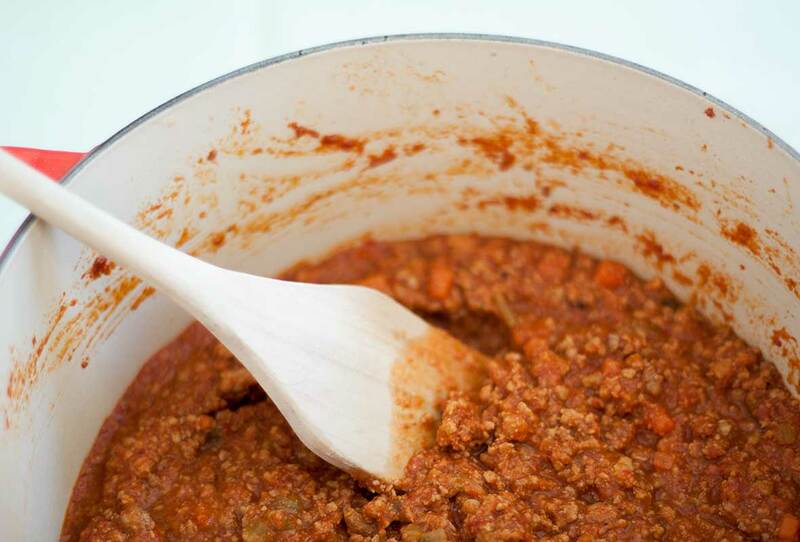 Lovely to hear you’ll be making this bolognese sauce, Leah! And it’s not a dumb question at all. Yes, you can skim the fat from the surface of the sauce but try not to do this while it’s cooking because the fat will lend flavor to the sauce. Only skim it after cooling. Looking forward to hearing what you think! Great. Looking forward to it! Thanks! This was truly sensational. I cannot reiterate how perfect this bolognese was. I did add pancetta and I need to use onion powder (1tbl) as I’m intolerant to onion, but gosh, this was the bomb! I enjoyed the cooking process too, very therapeutic. I will never make bolognese any other way, ever!! Kitty, so glad to hear. And happy to see that you’re making it your own. A good recipe doesn’t stand on ceremony or rote recreation. Melissa, absolutely! It may have to cook longer, though. Whilst the orginal authentic recipe has cream added to it (served with tanglatelli), i can assure you, nobody, i mean nobody, and that is from a 93 year old sardinian grandmother to ‘everybody i know’ (a lot) uses milk or cream in the ragu here. You yanks have had an italian job done on you by the dairy industry. And btw carbonara HAS NO CREAM either!!! :) Milk and meat!?! You should try eating mussel cooked in milk, see how you get on. Thank you for putting this recipe up with great lead in and discussions. I have been on a global search for a good Bolognese and now I think I have found it. In our own Washington DC kitchen. My mother was born in Roma and the amazing dishes I was raised on are hard to put into contact how Fortunate and blessed I am. As a military officer, I’ve travelled the globe and to me nothing compares to Italian cooking I was raised on and during my summers as a kid in Roma. Soon as I made this dish I went on line and bought the late (Zia) Hazan’s book. I’m excited to dive intto the numerous dishes. You honor her by keeping her legacy alive and well with people like me. As my mother ages I will now enjoy using my mom’s recipient along with Marcella’s. This recipe was perfect. I executed it exactly as the book described. I want to attempt veal and pancetta my mom brought back from Italy on my next experience. Two questions for you if you could be so kind to comment. 1). Does the type of wine matter (i.e. Pinot, Chardonnay etc) 2). Do the leanness of the meats cut matter and if so how? Thom, my pleasure. I’m so delighted you enjoyed the recipe. As far as the wine, any dry vino will do–as long as it’s something you’d drink. And as to the leanness of the meat, I use 90% for the beef and whatever the butcher hands me for pork and veal. So, that’s a long way of saying: There’s a lot of flexibility to the recipe. Thank you for introducing this recipe to me. I’ve made it a few times and the flavor is delicious. I wonder though if I am doing something wrong, because I can never get the 2 cups of milk and 2 cups of wine to evaporate even after hours of simmering. Yestaterday I spent all day on this sauce and after 3 hours the milk was only reduced by about half so I just went ahead and added the wine and kept on going. The sauce tastes great but it’s still pretty liquid at the end. Is this anyone else’s experience? Sylvan, that’s odd because liquid will eventually evaporate. It’s physics! What kind pot are you using? A taller pot will take longer for the liquid to evaporate. Hi, I’m new to your site and I’m thrilled to have found it. I’m trying Marcella’s Bolognese recipe as I write this. I’m an hour into it and have just gotten to the point where I’ve added the tomatoes. Does that sound about right? I’ve loved reading everyone’s comments about this sauce. It’s nice to see with so many helpful and respectful comments. Welcome to the site, Mari B! Happy to have you join us. Yes, it seems as if you’re right on track with the recipe. Please let us know how it turns out. And you’ll find all the comments here respectful. It’s part of who were are and we take it very, very seriously. I’ve been making Marcella’s bolognese from “Essentials” for several years and haven’t bothered to learn another. I like finishing penne in it. Several variations over the years due to not having things: finely chopped beef rather than ground, red wine instead of white, a little chopped pepper in the vegetables–but the essential ingredients are nutmeg and milk. Love this recipe. I used 4 Tbsp butter and 2 Tbsp butter made was canola oil. I used 85% beef and pork. There was so much liquid even before the milk. I cooked that part til the whiteness was gone from liquid. I added wine but with so much other liquid doubt it evaporated but I added tomatoes anyway. It’s been 4 hrs since then. Less liquid but still a lot. Is this normal? I even scooped out a few spoonfuls. What will the separated fat look like? Sharon, it sounds like the pork or beef you use had a lot of water in it. That can sometimes happen. The total simmer time for this recipe is between five and six hours, if not more. I would suggest continue cooking until more of the liquid evaporates. If after all that time it’s still very liquidy, then, yes, spoon off some of the liquid. I discovered this recipe decades ago when I bought Hazan’s book The Classic Italian Cookbook. I rarely if ever buy prepared spaghetti sauce anymore. It is easy and the taste is so wonderful. My brother in law would have the leftover spaghetti for breakfast the next day. It is also one of the things that will get my son to the dinner table. One of the best versions is with very ripe homegrown tomatoes. The sauce will have a golden light color and unbeatable flavor. Cooking the meat her way mellows the taste with the milk and gets rid of heavy meaty, slightly gamey flavor, especially with ground beef. I have also made it without meat or added Italian sausage. I remember days in college where we would add wine, other spices to the tomato sauce, but this is the real thing and so savory. I no longer order spaghetti in non-Italian restaurants as I have been disappointed compared to this version. Thanks for that, L Heather. You’re right: It is so easy…and so adaptable. I made this today. It is fabulous and a keeper! I did add more meat than the recipie calls for. I used 1 lb each of veal and chuck, and about 4 oz pancetta. It was very greasy even without the pork, so I’ll use a leaner beef next time. I drained a lot of the grease before I added the wine. The end result was just perfect. I love this recipe ! I would like to know if I can substitute coconut milk for the milk. Trying to keep it dairy free. Idit, we didn’t try it that way, so we can’t say for certain. But I like the way you’re thinking. If you try it, I would water down the coconut milk with about 2 parts coconut milk and 1 part water. Be aware that it will add a little more sweetness to the sauce than regular milk. Kindly let us know how it goes! Idit, love the substitutions, both of them!!! Thank you so very much for letting us (and our readers) know! I suspect there’s sufficient other flavors to overwhelm the coconut so that its sweetness just sorta smoothed everything together. And I personally loathe celery so I appreciate the fennel trick! I guess I should point out that I used a can Thai Kitchen Lite Coconut Milk and I did dilute it a bit. What a beautiful dish to prepare on a lazy boxing day. Just a few minutes chopping, a few more minutes stirring then time to relax and watch a day of soccer. The sauce happily burbles away and is very content to be given a quick stir at halftimes. Such an easy comfort meal. Love hearing this, Beth! And I know you have excellent taste in recipes and so I obviously trust your judgement. And seems like the results proved you right. Very disappointed with this recipe. Too much cream, not enough tomatoes, and way overcooked. Will not make again. Hi Susan, so sorry that you did not like this recipe. It is one of my favorites and always transports me back to Italy. If you like a pasta with more tomatoes, you might want to try this. It is especially lovely with ripe summer tomatoes. I made this recipe over the weekend and it was …… perfection. Grateful to all the previous comments (I think I read all of them), I followed Marcellas recipe to a T, adding milk then wine, with the only exception being I didn’t use veal or pork (only because I didn’t have any). The result was an intensely flavoured, perfectly rich Bolognese. I tripled the recipe, used two Le Creusets simultaneously!, and it still turned out amazing. Grazie Marcella! Hi June, isn’t this an amazing recipe? I just love it, comfort food at its finest and perfect for this chilly weather. This recipe is killer. My husband and I have each made it, with slight variations, and both times it turned out insanely good. 5 stars! So happy that you and your husband both loved this sauce, Ali! Would love to hear of your variations. Hi, I’m looking at Marcella’s recipe right from her book ; essentials of classic Italian cooking and this recipe is off. It calls for one cup of milk and one cup of wine. Plus 4 tablespoons of butter, not 8 and only 3/4lb ground beef. I learned how to cook from my aunt and grandparents from Sicily so I know how to adjust. This recipe just seemed off to me which is why I pulled out my book. Kim, if you look at the recipe, I say it’s my take on her dish. I also explained what to do with the meet. But also, if you look closely, you’ll see all the ingredients are doubled, because this makes twice as much as her recipe. That’s why the double butter, milk, and wine. Thank goodness it’s autumn in Sydney and I can make this again. Best ever recipe. Thank you. You are more than welcome, Fiona!